The old weather proverb says “March comes in like a lion and out like a lamb.”. From the weather today, I would agree the cold and rain here would constitute a lion day. When it comes to my swimming, I want to be a lion now and an even stronger lion come April 1st. 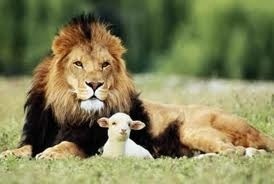 Lambs are cute, especially the one in the picture, but for an athlete, the lion portrays strength, confidence and power. Not to mention a don’t mess with me attitude. Based on the 100 meter time trial this morning, I too am off to a lion start. Going into the workout I was concerned that my cold might impair my performance. I did my 1,000 meter warm up (flip turns included), followed it by 4×50 meter sprints to get the speedy feeling going, took a minute break and took off. The past two time trials I swam the 100 in 1:52 each time. I really wanted to break 1:50. When I hit the wall and saw the time, I had to smile – 1:48. Seeing my effort put into my training pay off is a big confidence booster. I don’t just believe I can do it, I know it. I am getting stronger and more powerful. This feeling of accomplishment won’t last forever, I know. There will be days I feel like I am barely treading water, if not going backward, but I have proven to myself I am able to improve. There is still much room for improvement, and my mantra “believe” will be with me all the way. Yes, there will be cheetah’s that pass me up, but I am competing in my own race. When my doubts crop up, I have to remember the lion and the don’t mess with me attitude. After all, who wouldn’t want to be king, or queen, of the jungle? That is a good mantra too! Although I keep hearing the song “I Am Woman” in my mind now… Thank you for the encouragement!